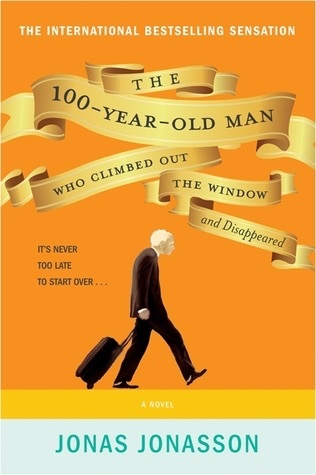 A few weeks ago I finally got round to ordering it and will sit down over the weekend to start reading a book about an old man about to turn 100 who runs away from the place he is living and the adventures he has along the way. Escaping (in his slippers) through his bedroom window, into the flower bed, Allan makes his getaway. And so begins his picaresque and unlikely journey involving a suitcase full of cash, a few thugs, a very friendly hot-dog stand operator, a few deaths, an elephant, and incompetent police. As his escapades unfold, Allan’s earlier life is revealed. A life in which – remarkably – he played a key role behind the scenes in some of the momentous events of the twentieth century. You might think he could have made-up his mind earlier and been man enough to inform his surrounding of his decision. But Allan Karlsson had never been given to pondering things too long. This manoeuvre required a bit of effort since Allan was 100 years old, on the very day in fact. There was less than an hour to go before his birthday party would begin in the lounge of the Old Folk’s Home. The mayor would be there. And the local paper. And all the other old people. And the entire staff led by the bad-tempered Director Alice. It was only the Birthday Boy himself who didn’t intend to turn up…. Here’s hoping the wait has been worth it. Have any of you read it – was it as funny as advertised? This entry was posted in Books, Fun Friday and tagged Allan Karlsson, friday fun by Cathy. Bookmark the permalink. Let me know, Cathy, if this is worth the time. Sounds like it could be fun! I’ve never heard of the book and eagerly await your review. I think I rmember Kay of Musings talking about this one, she liked it. I have read it. It is a romp. He has written another as well which I will get to in the fullness of time. I enjoyed reading this post. I have not read the book but by your description and comment he sounds like 27 years older version of me. Every so often I go walk about, without my minder, just to test out my coping skills. I have had some really adventurous ones over the last few years, alone in a foreign land is a real buzz. Even my recent trip to Sydney staying at a Airbnb at Bondi kept me on my toes. I also don’t plan much just do it traveling light is my only thought. I went to the opp shop and bought warm slippers, cold feet never crossed my mine when packing my carry on bag. Hope you enjoy your cruse and you do a post about it. The summary sounds awesome. I’ll look forward to your thoughts after finishing it! Now I want to read it!!! It did remind me a little of Forrest Gump… sort of. I did enjoy it a lot and I had fun seeing the movie as well although there was violence. My BFF who died hated it so I didn’t bother, but let me know how you do. I read over half the book last year (it was our book club pick one month). I put it down and never got back to it. I recently watched the movie though, and it seemed to follow the book quite well. The movie seemed funnier, but I think overall our book club liked it. I’m anxious to hear what you think!